While we’re enjoying a slice of avocado tomato toast, I have to tell you about CRABPOCOLYPSE 2015! You read that right. Crabpocalypse. It is the name I have given to the mass exodus of crabs that happen to invade our neighborhood once a year. I live on the east coast of South Florida. The St. Lucie river runs behind my neighborhood. We can easily access the river via a trail through the preserve area that surrounds our neighborhood. Living within a preserve area that’s located near a river brings a variety of little critters into our neighborhood and our yard. Gopher turtles, raccoons, opossums, armadillo and yes, even blue land crabs have made their appearance in our yard. During the month of August, hundreds if not thousands of blue land crabs invade our local roads and neighborhoods, all in an attempt to make it to the land of blue crab mating aka blue crab baby making. For some reason, the little crabs love our yard. Often making their appearances during the early evening hours, they have been spotted climbing up our screen door, attempting to break into our house and trying to hitch rides to other towns. One little crab did manage to hitch a ride within the hood of my car from Stuart all the way to Palm Beach Gardens. 25 miles, way to go, little crabby. I enjoy watching the little crabs but what I don’t enjoy is that they are often run over cars. It makes me sad and I do not like to witness this tragic event. If I’m able to catch a crab, I will pick it up and move it out of the road and into the grass. If I’m unable to catch it, I run after it, chasing it away into the grass. All while it’s little crab claws are trying to attack me. Silly little crabs. One crab dug a little crab hole in the flower bed outside of my front porch. A friend of mine helped me name him – Christopher Crab. Christopher Crab was very social and enjoyed having parties. One time, there were 4 crabs hanging out in his little crab hole! By the end of September, the crabs are gone…until the next year. 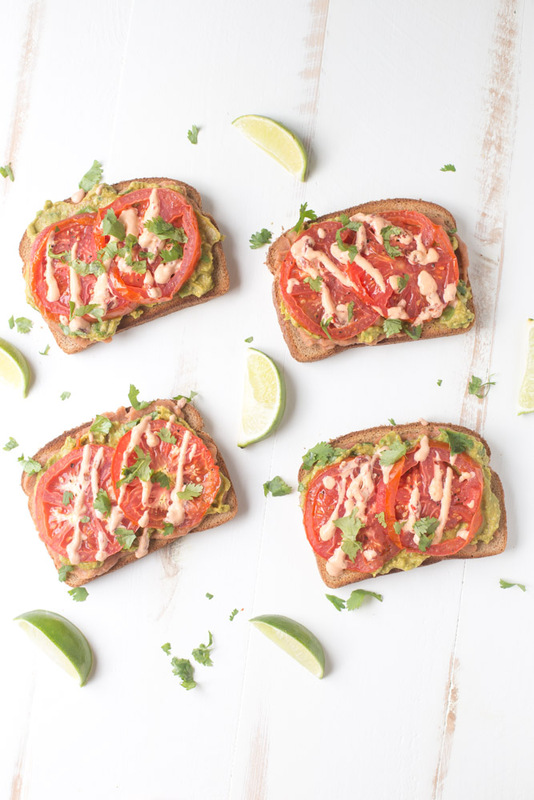 This avocado tomato toast may be enjoyed for breakfast or lunch. 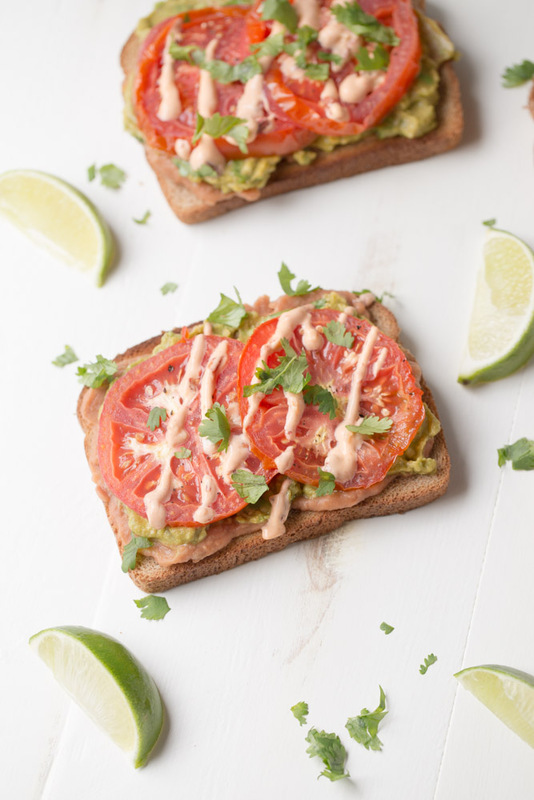 They’re as simple as toasting some bread, spreading a little vegan refried bean and mashed avocado, topping a little tomato and drizzling a little vegan mayo. Toast, spread, top, drizzle. Turn on your broiler. Line a baking sheet with aluminum foil or parchment paper. Spray with cooking spray. Place tomato slices on the baking sheet. Drizzle with a little olive oil and sprinkle with salt and pepper. Broil for 3 minutes. Remove from oven and set aside. Prepare the avocados. Mash in a mixing bowl. Mix in smoked paprika, hot sauce, lime juice, cilantro and salt and pepper. Prepare they mayo. Whisk together the veganaise, chipotle pepper, adobo sauce and garlic. Toast the bread in a toaster on the medium setting. The resulting toast should be crispy and firm. Assemble the toasts. Spread 2 tbsp of the refried beans on each toast. Divide the avocado mixture between each toast (about 2.5 tbsp each). Then top each toast with 2 tomatoes. 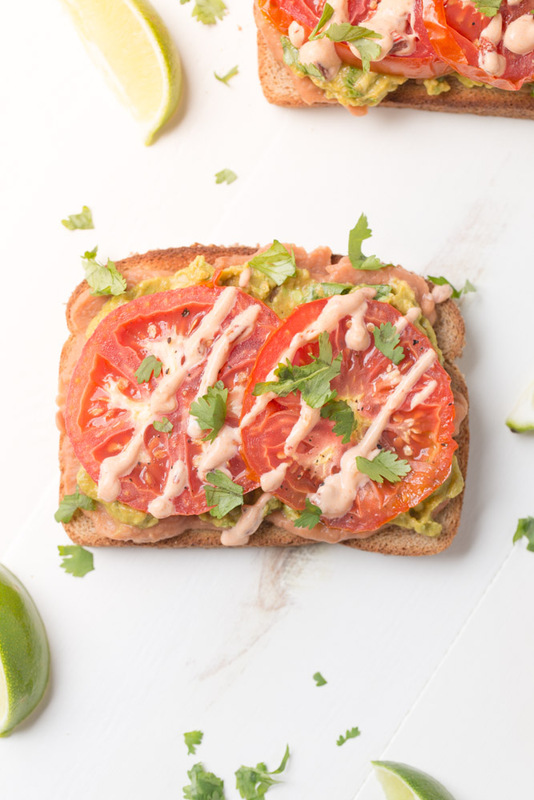 Drizzle each toast with the chipotle mayo and garnish with cilantro. Love it. Love it. This is the perfect type of breakfast for me. Love the paprika addition! This is the best avocado toast I’ve ever seen! Love the chipotle mayo! And refried beans-just perfect! Pinned! Aww thank you, Cheyanne! Hope you enjoy the toast! Sad to say, I have not seen any crabs since last week. I think they have moved on. Boo. YUM! These look so light and delicious! A perfect lunch idea. I wish I lived in South Florida! Avocados + refried beans are one of my favorite food combos. So full of flavor and so satisfying!! Hey Hey Lady! I’ll be featuring this yummy recipe tonight on the Found & Foraged Linky party!